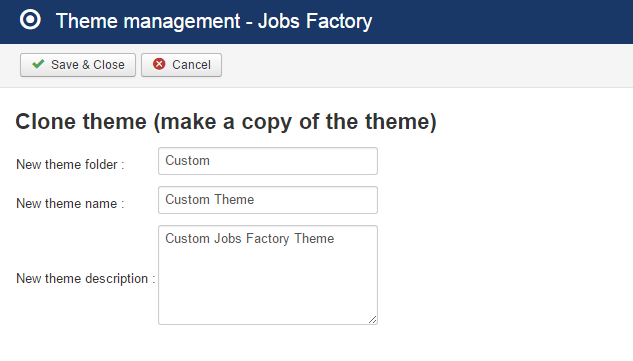 Jobs Factory comes with a Default responsive theme which can be edited accordingly. Going to Settings/Themes allows you to upload new theme packs or to duplicate the existing ones. Check themes display by enabling and hitting refresh on the frontend page. In case you want to create your own theme, the most easier and secure way is to copy the Default Theme by selecting it and clicking on the Clone Theme button. This way it will make your job easier by customizing around it while the content of the default theme remains untouched. Simply add the name of your new theme and of its folder and a description of it. All theme related files can be found on "[siteroot]/components/com_jobsfactory/templates/[template name]/". There you will also find the necessary default folder which is component required. If a certain template is not present in the custom theme folder, then the default theme will be displayed.